Here we are with the most recent Project Life spread. I have to tell you the new AC Digitals papers and elements are giving me such a creative boost. As most of you know (if you read here often), I’m obsessed with the Cobalt kit from last year’s Project Life release. Still love it. It’s still my favorite, even with the new sets and the sets that are dropping this spring. However, the new patterns and color combos are giving me a “new” feeling in my spreads and I’m loving it! I’ll get back to Cobalt, that’s for sure, but for now, I love the AC Digitals options. This was a very non-eventful week in the house of Moreno. 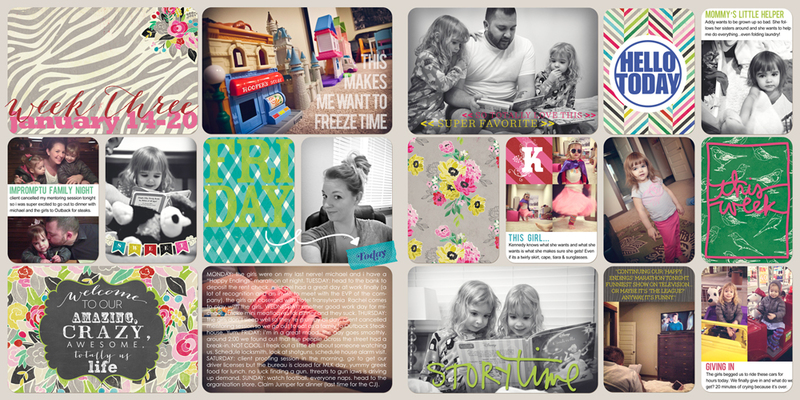 If you feel like you don’t have enough pictures or your world isn’t very exciting, I hope these layouts might give you some inspiration. I purposely brought out my big girl camera one night to take pictures of our nightly routine because we were doing so little during the day. I also took series photos to fill. Notice the 3 photos of Kennedy in the tiny template all dressed up after her bath. That’s a good way to add variety even if you don’t have a lot of photo moments. I ended up with way more than I had originally thought I had. How fun is the little chalkboard? It’s just a chalkboard image and then I put the fonts over it. Love how it turned out. A great way to incorporate some verbiage with a busy pattern. I’ll be using this again. I’m focusing on getting down on the girls’ level to take photos of them. I want to see the world the way they see it. I remember wearing my moms heels when I was little and feeling like I could see so much more when I was “taller.” I think the same is true when we become smaller. I get down on my stomach, I crouch down, I lay down. Try thinking on their level when taking their photos.